Are Catholics too willing to accommodate others? Recently, I was blessed to have both the time and the opportunity to visit St. John Paul II’s shrine in Washington D.C. It was one of those pilgrimages that, in spite of my living only a four hour drive away, I had yet to complete. However, in this Year of Divine Mercy, my wife and I were determined to go, and the fact that the shrine was also hosting an exhibit of relics and items from St. Thomas More’s life provided the final impetus. We were not disappointed. We had before us the examples of two men who confronted the evil of the world in which they lived in very different ways. St. John Paul II, as priest, bishop, and pope stood unbowed and unapologetic before the threats of both communism and secularism exhorting the world, “Be not afraid!” While St. Thomas More stood at the side of one of Europe’s great medieval monarchs, as Chancellor of England, a man of deep religious conviction enmeshed in, and ultimately martyred by, the machinery of great political power. It is often difficult to do so without sacrificing our Catholic beliefs and principals. Sometimes we convince ourselves that we do so for the greater good. Often, we accommodate too much. If I was more awed by the sweep and scope of Saint John Paul’s life and papacy—truly one of the most powerful influences in my life—I found St. Thomas More’s story the more moving, if only because I find it so easy to identify with his plight—I, too, spent most of my life within the very secular workings of power and state, as both a soldier and a police officer. The challenge he was forced to confront was also familiar to me; perhaps to you, as well. Unlike the great pope, most of us must struggle almost daily to accommodate the secular world in which we find ourselves. It is often difficult to do so without sacrificing our Catholic beliefs and principals. Sometimes we convince ourselves that we do so for the greater good. Often, we accommodate too much. Consider the following. Vice-President Joseph Biden was honored during the first half of this year with an award from Notre Dame University, arguably the flagship of the Catholic educational system, for his years of public service. President Barak Obama received an honorary degree from this august institution in 2009. Considering these two events, both past and present, one would assume that all is well between the Administration and the Catholic citizens of this country. If I were not Catholic, I might agree. Let’s begin in 2009 at another prestigious Catholic university. Two days after the Easter Triduum, President Obama gave a speech on the national economy from a stage at Georgetown University in Washington, the oldest Catholic university in the United States. Prior to the President’s address his advance team requested that the symbols behind the stage be masked. These objects were a gold cross and an IHS monogram representing the name of Jesus. These symbols are ubiquitous throughout Catholic institutions and carry great meaning to all Christians. Georgetown is, after all, a Catholic school, a fact known to the President and his advance team and staff prior to their selection of the venue. I think it is safe to say that no such request would have been made of a Muslim school or Jewish institution, and if it were, they would have politely, but firmly, declined the honor. Astonishingly, this request was granted by the university’s president. The only voice raised in objection, to my knowledge, was that of Bishop Galante of the Diocese of Camden, in an informed and moving plea appearing in the April 24 th issue of the Catholic Star Herald. The media in general found nothing to report on in this matter. The Notre Dame ceremony, which followed shortly afterwards did, however, manage to garner some notoriety, thanks largely to Mary Ann Glendon, a graduate of Notre Dame then serving as our ambassador to the Vatican. She, too, had been invited to the graduation to receive the Laetare Medal and present a shared commencement speech with President Obama. On grounds of her faith and the teachings of the Church, she declined—the first person in the history of the school to do so. The issues there, as it should also have been at Georgetown and any Catholic institution then, or now, as in the current case with Mr. Biden, is one of identity and obedience—identity as defined by one’s faith or principles, and obedience to the same, and not to secular power that should have no interest in these matters and should certainly avoid demands of primacy even if they do. President Obama and Vice President Biden, a Catholic, condone and promote abortion and embryonic stem cell research; the Church utterly condemns these practices. These facts, like the identities of Notre Dame and Georgetown Universities, are well known and unhidden. These invitations and awards are not without meaning, but laden with a symbolism, intentional or no, that is repugnant and ominous to the free practice of religion in this nation. Perhaps, to the non-Catholic, the most puzzling aspect of this entire interaction is the compliant role played by the leaders of these universities, as well as a great many bishops, priests, and lay people. You will not be surprised to learn that Ms. Glendon was not reappointed to her post with the Vatican. I suspect she saw that coming from a long way off. It was a sacrifice she was willing to make, even as so many others appear willing and even eager to scramble beneath the pharonic cloak of political correctness. One stood fast. Saint Thomas More was another who stood fast. He too was a lay person, yet one of exalted rank within the court of King Henry VIII of England, a powerful personality of his day and a strong-willed monarch. Unfortunately, in spite of his legendary will, and sexual prowess, the king experienced difficulty siring a son and heir. This problem necessitated discarding unfruitful marriage partners through various stratagems. When, at last, the Church refused to grant him a divorce from yet another unhappy coupling, he declared himself the head of the Catholic Church in England thereby relieving the pope of his duties insofar as Britain went. Henry’s court and peoples declared themselves enthusiastic supporters of the idea and anxiously signed on—how much of this enthusiasm was a result of wholehearted agreement as opposed to the king’s well-known proclivity for violence, could perhaps be debated. In the event, when a show of hands was called for, one remained conspicuously by its owner’s side; that of Sir Thomas More, chancellor, knight, lawyer, author, family man, and most unfortunately as it turned out for him, devout Catholic. Sir Thomas suddenly found himself a very lonely, unpopular man. In order to appear innocuous and harmless to non-believers we keep our heads down and say nothing; we fear being identified as Catholics, as if this somehow disqualifies us as “true” Americans. We Catholics, both clergy and lay, would do well to consider his simple but profound words within the context of our own times. In order to appear innocuous and harmless to non-believers we keep our heads down and say nothing; we fear being identified as Catholics, as if this somehow disqualifies us as “true” Americans—nothing could be further from the truth. Rather it is the other way around—we betray our church, our faith, our nation, and ourselves when we do not stand up to be counted in matters such as these. In doing so, we defend not only our own rights, but those of others, as well. What was done at Georgetown and Notre Dame can be replicated elsewhere; within any institution—all it requires is compliance. And what has been gained by these accommodations? The Little Sisters of the Poor have been forced to file suit against the Obama Administration over its unbending demands that they provide birth control and abortifacient pharmaceuticals to their employees. A herculean effort by the Knights of Columbus, tantamount to a public shaming, was required in order to force the President to declare as genocide the wholesale murder and displacement of Christians and other religious minorities in the Middle East. Even the United Nations had already acknowledged the obvious in this matter. And within the last few days with have the email leaks from Hillary Clinton’s campaign manager that reveal a sneering contempt for Catholics and the need for a “Catholic Spring”, presumably to bring us out of our medieval darkness. These things and more have been our rewards. There is no shame in holding to one’s faith as embodied by the Holy Catholic Church. 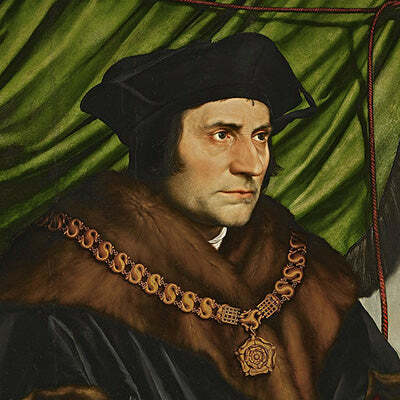 Over five hundred years after the events of Saint Thomas More’s life, it is he that we recall, not all those that remained silent in spite of the debate that must have raged within the breasts of many. This may yet be another time of martyrs, in a world grown increasingly secular and militantly anti-Christian. Yet, within our ‘civilized’ nation these martyrdoms will seldom carry the penalties of death or dismemberment suffered by Saint Thomas More, but will offer the cruel and public scorn of celebrity godlings, political sycophants, and media personalities devoid of wisdom but long on disdain, all anxious to extinguish the light of Christ while extolling a false humanism that masks pride, gluttony, and at its core, a cold, selfish cruelty responsible for the deaths of millions of unborn children. If you enjoy David Dean's writing, take a look at his compelling novel, which Tumblar House is very proud to have published.